Appeasement doesn’t work when it comes to Muslim extremists! Surely what happened in Paris, should be a real warning (if it was needed) about the ramifications of triumphal religious (in this case Muslim) ideology, where criticism is silenced or eliminated by the bullet and the murderer’ happy to die and enjoy their 72 virgins for all eternity. Why did this happen in France,one of the most secular countries in Europe? With over 5 million Muslim immigrants from North Africa, these people were already indoctrinated,with their homes and communities in France becoming extremist hotbeds. Mix the highly conservative beliefs and practices, which are absolutely unwelcome in secular France, and you have a powder keg of two diametrically opposed mindsets, feverishly fermenting. It seems to me that even the most preposterous ideas can be considered as sacrosanct,once cloaked with the invisible mantle of “religion”. Governments should stop providing a misplaced equality, to these horrible ideologies and start seeing them for what they really are. Mind poisoning dictates, that will/must be obeyed! cartoons in be reprinted in any Irish newspapers. Free expression should never be heldunder the fear of being shot, burned or blown up. What a horrible world that would be! 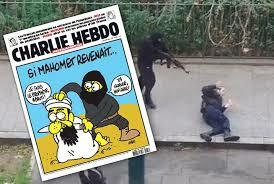 After Charlie Hebdo was killed, the killer ran on to the streets shouting how he had avenged the prophet. If this is not a sign of mental sickness, then what is? Blood lust is built into the Muslim sect. “ There is no god but allah” and “”death to the unbelieving infidels”. We know from history how terrible, a policy of appeasement can be. Expressing any criticism or “mockery” is always leaving yourself open to the suggestion that you are encouraging hate crimes. Absolutely not! It takes a certain kind of person, with a certain limited mentality to be able to kill or destroy in the first place. They are trigger happy dimwits, forever on the lookout for an excusing cause. Will they got their wish to die as “martyrs”? For me the real ones, are those who artistically said a resounding non to forced beliefs and silenced opposition. Hopefully many more will fill their posts! (Update Sun 8/2/15: Not one Irish media outlet has had the courage to reprint these innocuous cartoons. Yesterday Sky News reported that Ireland and Finland, were the leading European countries for exporting young Muslims to fight abroad in jihad. I wonder why? Were these cartoons really worth killing for? No comments Appeasement doesn't work when it comes to Muslim extremists!